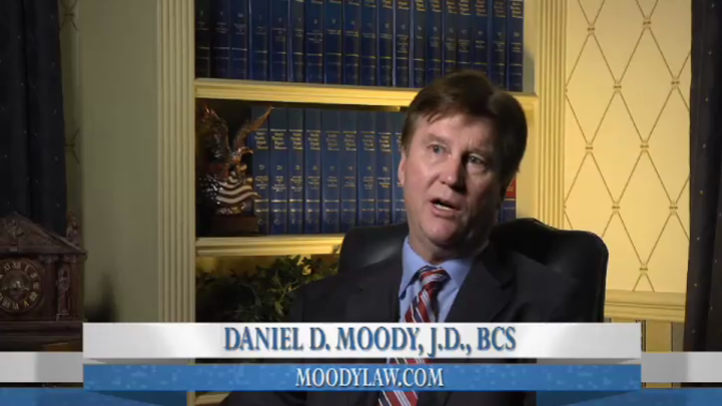 Daniel D. Moody, the founder of Moody Law, has been advocating the rights of the injured for more than 30 years. During this time he has established a reputation as a highly successful trial lawyer representing the injured in medical negligence, personal injury and wrongful death cases throughout Central Florida. He is certified as an expert in civil trial law and believes that full compensation for the client can only be achieved by aggressive and competent representation in the courtroom. Since 1985, Mr. Moody has held true to this philosophy and devoted his entire legal career to helping the injured. Mr. Moody is Board Certified as a Civil Trial Specialist by The Florida Bar, which is the Bar’s highest level of evaluation given for competency, knowledge, skill and professionalism as a civil trial lawyer. Less than two percent of Florida attorneys hold this certification. The premier Martindale-Hubbell peer review rating service used by attorneys and consumers for selection of legal services has given Mr. Moody an AV-Preeminent Rating. The AV rating represents the highest level of professional excellence a lawyer can obtain with Martindale-Hubbell. Mr. Moody has been selected as one of the National Top 100 Trial Lawyers. The National Trial Lawyers: Top 100 is an invitation only organization composed of the premier trial lawyers from each state or region who meet stringent qualifications as civil plaintiff trial lawyers. Selection is based on a thorough multi-phase objective and uniformly applied process which includes peer nominations combined with third-party research. Membership is extended to only a select few of the most qualified attorneys from each state who demonstrate superior qualifications of leadership, reputation, influence, stature and public profile measured by objective and uniformly applied standards in compliance with state bar and national Rule 4-7. Mr. Moody holds membership in both the Multi-Million Dollar Advocates Forum and Elite Lawyers of America. He is a life member in the Multi-Million Dollar Advocates Forum which is one of the most prestigious groups of trial lawyers in the United States. Fewer than one percent of U.S. lawyers are members. Both memberships are limited to attorneys who have won multi-million dollar verdicts and settlements of at least two million dollars. He has also bee selected by Rue Ratings as a Lifetime Charter Member Best Attorneys of America. With more than 30 years of experience as a civil trial lawyer, Mr. Moody has gained a thorough understanding of the law involving commercial truck accidents, automobile accidents, motorcycle accidents, medical malpractice, aviation crashes, and product liability cases. Many of his past cases have involved complex litigation and damages associated with catastrophic paralysis, traumatic brain injury, infant birth injury, Federal Motor Carriers, industrial accidents, aviation disasters and commercial truck motor vehicle accidents. Mr. Moody's commitment to his clients and his strong advocacy skills have resulted in multi-million dollar awards and settlements. In 2001, Mr. Moody represented a family of English tourists who were injured by a fatigued commercial truck driver. After several years of litigation and a trial, the case was settled. At that time, the case was reported to be the largest award ($5.6 million) in the history of Polk County, Florida. In 2012, Mr. Moody obtained settlement awards in two different medical malpractice cases of $3,050,000.00 and $9,500,000.00 totaling $12,550,000.00 and in 2015 Mr. Moody recovered in three separate motor vehicle accident cases over $10,000,000.00 for his clients. Mr. Moody's is no stranger to litigating against large multi-billion dollar corporations and insurance companies. Mr. Moody knows first hand how devastating a personal injury can be. In May of 2006, he was seriously injured in an automobile accident that almost took his life. For this accident, Mr. Moody had multiple medical procedures and spent months in the hospital, with a long course of rehabilitation. This experience gives him a unique personal understanding of the medical care and treatment involving personal injury that truly distinguishes him from other lawyers. Mr. Moody is a native and fifth-generation Polk County resident with strong family ties to the local community. In 1957 he was born the New Year Baby in Winter Haven, Florida. He earned his undergraduate degrees at Florida Southern College and Miami-Dade Community College. Mr. Moody’s degrees include a Bachelor of Science/Marketing/Business Administration and an Associate of Science/Arts. In college, Mr. Moody completed courses in medical terminology, human anatomy, physiology, microbiology, and chemistry. This science education background has provided Mr. Moody with added knowledge necessary to win for his clients in medical malpractice (such as surgial errors and failure to diagnose) and personal injury cases. Mr. Moody received his Juris Doctorate from the Cumberland School of Law, Samford University in 1985. While in law school he served as a United States Federal District Court Law Clerk and won the prestigious Finalist Advocate Award in the James O'Haley Federal Court Senior Trial Competitions. After graduating and returning home from law school, Mr. Moody began presenting cases to juries as an Assistant State Attorney. He then joined a prominent law firm in Gainesville, Florida, while primarily limiting his representation to clients injured as a result of medical malpractice. In 1991 he established his own law firm, Law Offices of Daniel D. Moody, and in 1993 he was a founding partner of Pansler and Moody, P.A. Thereafter, in 2006, he established Moody Law, P.A. Mr. Moody is an instrument rated private pilot and avid aviator. Aviation has become an integral part of his life and a helping hand in his legal practice. His aviation experience gives Mr. Moody special knowledge and understanding regarding aviation cases and crash investigation that non-pilot attorneys do not have. For example, Mr. Moody’s flying hours and aviation experience gives him a background of knowledge and understanding of the operations, mechanics, and physics of flight. This foundation underlies a basic understanding of accident investigation that carries over into many other non-aviation accident investigation cases. As an active aircraft owner and pilot, Mr. Moody has accumulated thousands of hours of flight time. His ability to privately fly has been a tremendous benefit for travel to court, depositions, client/witness conferences, and legal education courses. Mr. Moody and his staff can save time by efficiently traveling around the country for clients and other legal business matters. If you are looking for an experienced aviation attorney to represent you in an aviation crash case, or for other questions regarding aspects of FAA regulations and airmen operations, please contact Moody Law, P.A. Mr. Moody is married and has two children. His wife, Nancy, is a Physician Assistant, who graduated from the Physician Assistant program at the University of Florida, School of Medicine. His daughter, Mallory Moody Putnam, is also a graduate of the University of Florida and an ER Physician Assistant. His son, Andrew (Drew) Moody, is a third year law student at the University of Florida College of Law. Church and community involvement have always been a part of Mr. Moody's life. Mr. Moody has served in leadership positions in public, civic and professional organizations. He is a past president of Bartow Lions Club International and was a youth football coach. Currently, he serves on the Lakeland Sun 'N' Fun Chairman Advisory Board. He is also a member of the Lakeland Chamber of Commerce and the Bartow Chamber of Commerce. No attorney fees for professional services are charged in any injury claim unless there is a recovery or award obtained for you. To set up a consultation to discuss your case, please contact us online or call us at (877) 883-9090. Admitted to the Florida Bar in 1985. Board Certified by The Florida Bar as a Civil Trial Specialist. Admitted, ALL Florida State Courts. Admitted, Federal District Court, Middle District of Florida. Doctor of Jurisprudence from Cumberland School of Law, Samford University, Graduated with Honors of Dean's List, Birmingham, Alabama in 1985. Finalist Award Recipient - 1985 Jefferson County Senior Court Competitions. Federal U.S. District Court Clerkship in 1984-85 in Birmingham, Alabama. Bachelor of Science Degree in Business from Florida Southern College in 1980. Associate of Science and Arts with Mortuary Science Degrees, Miami-Dade Community College in 1978. 1975 Graduate of Fort Meade High School. American Legion Boy State Representative. Recipient of Martindale-Hubbell's AV Preeminent Rating-voted by members of the bar and judiciary for the highest level of professional excellence. Million Dollar Advocates Forum and Multi-Million Dollar Advocates Forum, Lifetime Membership. Best Attorneys of America, Rue Ratings’ Lifetime Membership. Best Trial 100 Lawyers in America. Elite Lawyers of America Membership. Licensed FAA Private Aviation Pilot with Instrument Rating. Former Licensed Florida Funeral Director. Former Licensed Florida Real Estate Agent. Eagle Member, Florida Justice Association. Member, American Association for Justice. Member, Polk County Trial Lawyers Association. Florida Bar Lawyer Referral Program Member. Member, Traumatic Brain Injury Litigation Group, AAJ. Member, Tiger Bay Club of Polk County. Member, First Presbyterian Church, Winter Haven, Florida. Member, Sun-N-Fun Chairman Advisory Board. Member, Aircraft Owners and Pilots Association (AOPA). Member, Experimental Aircraft Association (EAA). Past President and Director of Lions Club International, Bartow, Florida. Founder, Law Firm of Moody Law, P.A. – current. Founder, Law Firm of Pansler and Moody, P.A. – 1993. Founder, Law Offices of Daniel D. Moody, P.A., 1991. Former Attorney, Law Firm of Clayton, Johnston, Quincey, Ireland, Gadd, Smith, & Roundtree, Gainesville, Florida. Former Assistant City Attorney, City of Ft. Meade, Florida. Former Assistant State Attorney, State Attorney's Office, 10th Judicial Circuit. Program Moderator for the Civil Court Judicial Forum (What Civil Court Judges Want to Know). How to Win Trucking Cases, Las Vegas, NV. Litigating Traumatic Brain Injury(TBI) Cases-AAJ- Miami, FL. Advanced Trial Advocacy-Florida Bar-Gainesville, FL. Civil Trial Certification Review-Florida Bar. Central Florida attorney Daniel D. Moody is an experienced trial lawyer who has been committed to pursuing justice for personal injury victims since beginning his practice in 1985.